Peaceful rustic privacy can be found in beautiful Lakeland Florida, just minutes from town! Vintage gardens galore, 100 year old grandfather oaks and a tropical paradise flair too! Horses grazing in emerald green pastures, cattle grazing in distant pastures too! Enter our majestic vintage iron gated driveway, and wind down through the long driveway, feel the pressure of the outside world fade away..... taking you back to a time long forgotten. Enter a new beginning, an amazing day of creating shared celebration memories that will last a lifetime. Located between Tampa and Orlando Florida. Located only 4 miles from exit 4 on S.R. 570, just off I-4. The ranch is easy to find and a short drive to. Our Plantation styled home is nestled in southern moss-filled, grandfather oaks. and divine gardens. Blessed with 100 acres, our working cattle ranch offers unparalleled privacy for you and your guests. We provide modern amenities, a classic and comfortable barn, vintage gardens. Truly a beautiful palette for your event vision to be realized. We love our southern surroundings and know you will too! Our specialities are Vintage Garden Weddings and Rustic Weddings, we also host corporate and civic events too! A unique day of creating memories and shared experiences never to be forgotten, by you or your guests. We host only one event per day, to assure that you have our undivided attention to detail. Our Brides and Grooms may choose from several naturally beautiful ceremony sites and spectacular reception sites where you can celebrate your memory making day here at the Rocking H Ranch. 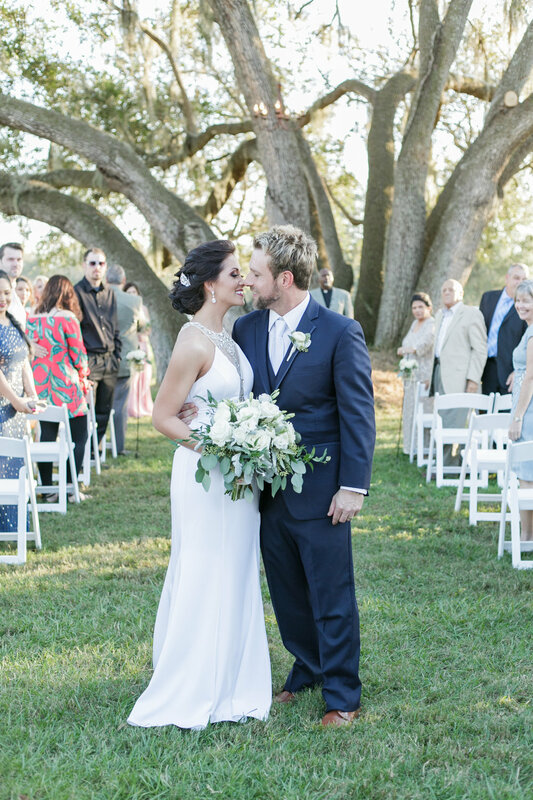 You may plan a barn reception with all of the amenities or choose to be outside under the stars, the moon and our lighted grandfather oaks canopy. We especially love the lighted hanging chandeliers in our vintage garden reception area. Our barn is climate controlled and can seat as many as 299 guests indoors. Our barn bonfire area surrounded by market lights and picnic tables for an outdoor experience. We can't wait to show off our new Barn Bridal room suite. It was designed for your comfort in preparing you for your special day with your bridesmaids. Our full ranch rental includes a Groom's Den. It includes privacy, comfort, flat screen tv, pool table, kitchen and a full bathroom too! We host wedding ceremonies and receptions, unique corporate events, charity fundraisers and family reunions. Our venue provides a “one of a kind” atmosphere, from corn toss games to hayrides, picnics to bonfires and “smores”. Enjoy our 60,000 gallon tropical pool setting for a cocktail social. Our offering includes setup and breakdown of our own tables and chairs for both the ceremony and reception. Included are tons of large props with this set up plan. Large props range from tractors, wagons. carriages, handmade farm tables, whiskey barrel buffets to chalkboards and easels. Even our "Shabby Abby", a 1924 Dodge Brothers convertible car is an included large prop! Our newest addition will soon make small table decor available for your guest tables, if you desire one stop shopping. We offer vintage silver, milk glass, modern cylinders and mixed china, or a more rustic decor with mason jars, porcelain ware, branding irons, rusty buckets and lanterns. Pricing varies on your selected package. Linens can also be added to the package as well. We offer something for everyone! We also have a Vendors list you can trust, no fee based listings. These are proven professionals we trust with our clients most important day ever! You may choose outside vendors if you so desire, we welcome new vendors. Standard industry licensure is required. We are "Anything but Ordinary", and we believe your celebration should be too! Please allow our team to tailor your wedding vision into a reality! From civic events to family reunions, our ranch can accommodate! See how we can make your dreams become a reality!